The demand for textiles is increasing and more production occurs in low-income countries where competition for fresh water increases with climate change. 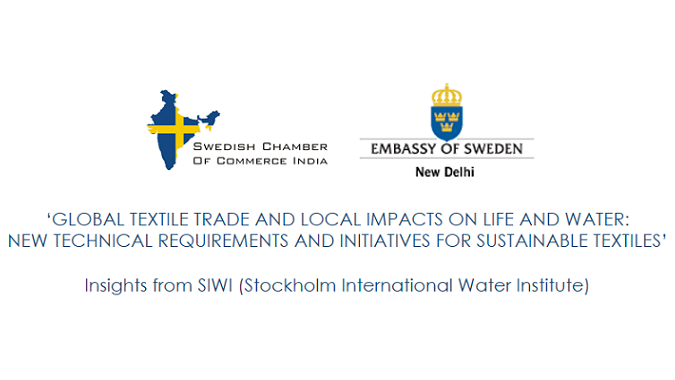 Dr. Jenny Grönwall, Programme Manager with the Stockholm International Water Institute (SIWI), has conducted a study which examines how a more sustainable textile industry that balances various interests can be achieved. During the 90s, exports of textiles from Tirupur, India, exploded with huge releases of effluents as a result. Today, the sector employs some 200 million people and the Indian authorities face difficult decisions about the allocation of scarce water resources, while Western consumers demand Corporate Social Responsibility (CSR) from retail brands. 1. How has the area's industrial revolution of the last 25 years affected local living conditions? 2. How are environmental technical requirements, such as Zero Liquid Discharge perceived? 3. Do courts take environmental considerations at the expense of economic conditions? 4. How well do the CSR indicators that Western companies use reflect local conditions?